The Ball State University Libraries’ GIS Research and Map Collection (GRMC) is displaying a special map in its front windows on the second floor of Bracken Library. 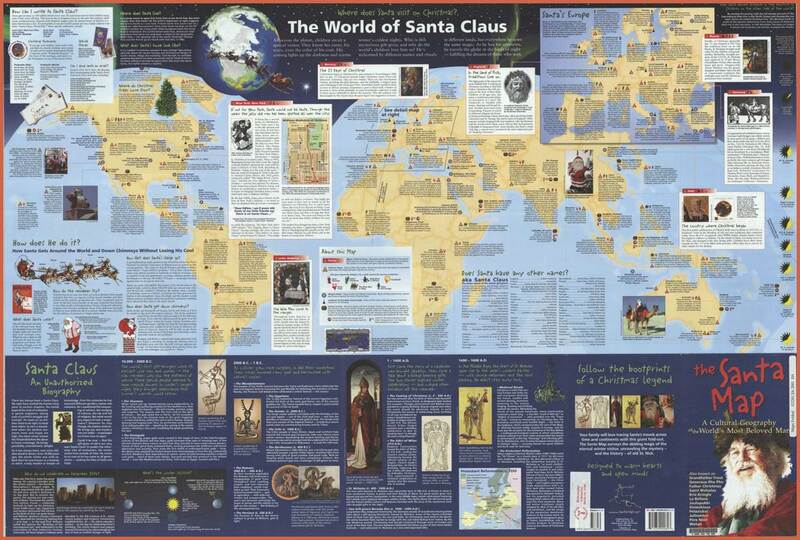 The display features a map called The Santa Map: A Cultural Geography of the World’s Most Beloved Man. The map shows the various incarnations of Santa Claus around the world, features a map of the Roman Empire and key cities during the time of St. Nicholas, a map of “Santa’s Europe,” and a map of early polar expeditions. The map was published by the Hedberg Company in 2001. ESRI, the world’s leading GIS software publisher, is also featuring a story map showing Santa around the world created by Matt Artz. This interactive map shows the history of Santa Claus dating back hundreds of years to Nikolaos of Myra, Turkey. Maps from the GRMC circulate for two weeks or longer and may be used for classroom displays and other research and learning projects. Bracken Library offers GIS software on most of the computers in the building, and the GRMC offers access to GIS software, data, and one-on-one assistance from the GIS Specialist. The GRMC is open Monday through Friday from 8:00 to 5:00.